With summer nearly here, it’s time to get outside and enjoy the warm air! Though you’d probably rather be playing Wizard101, these variations on classic favorites will make you feel like you’re in the Spiral. Here are a few ways to mix those games with Wizard themes to get the best of both worlds. In this variation of Freeze Tag, the person who is “It” is actually a high-level Ice Wizard. Everyone else is a Level 1 Fire Wizard. Just like in regular Freeze Tag, the Ice Wizard is able to freeze the Fire Wizards by tagging them with a single touch. The Ice Wizard levels up every time he or she freezes two people. Fire Wizards can level up, too! Simply thaw a teammate to gain a level. The Ice Wizard automatically starts at Level 5 and must reach Level 20 to win the game. The Ice Wizard can also win by freezing every person in one round. Fire Wizards start at Level 1 and must unfreeze 10 people and reach Level 10 to win. Perfect for the park, this outdoor game can be played with a few people or a large group. Before starting, choose an area to be home base and have each player pick out a particular spell to use. 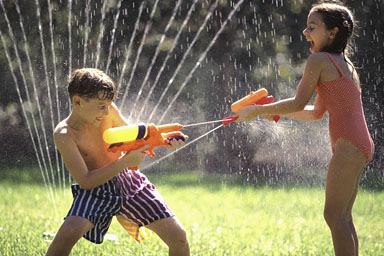 The spell is to be yelled before you shoot your opponent with your water gun. Players who are hit have to return to home base, where they must count to 30 and add a sticker to their clothing before they are healed and able to return. The sticker indicates to other players that a full healing has taken place. The person with the fewest stickers wins! Unlike in the traditional Hide and Go Seek, there is no actual base in this game. The person who is “It” takes on the persona of Malistaire Drake, the former School of Death professor, and must cast spells on those who are hiding. Upon finding a player, Malistaire will yell out one of his evil spells, forcing that person to become a member of his Death Wizarding team. The team will then travel all over the land (or backyard) to find others to enchant. The last person found becomes the next Malistaire. To begin this fun scavenger hunt, write down a list of your 10 favorite items from Wizard101. These could range from boots to a pendant to a wand. Find objects to represent these items or draw them out on paper. Have your mom or a friend hide all of these items in your backyard, then work in a team to find them. When every item from the list has been collected, develop a story about how you can use them to win a battle. Take your love for Wizard101 and use your imagination to change games you’ve played for years into something even more fun this summer!